You're sitting on the couch, reading catching up with the latest on your favorite webOS community site (hint, you're probably reading it this very moment). You notice that it's Fitness Month at Mobile Nations, and while we're approaching the end of February, you do kind of feel the motivation to get into better shape. The problem is, you haven't a clue of where to start. You can go ahead and check out apps like Couch to 5K to get you out and running, and that helps with some of that extra weight around the middle and your endurance, but what about getting to the point of being 'strong'? That's another matter all together, and that's where Infinite Appz's conglomerate guide Fitness Appz comes into play. Built on the same principles as Couch to 5K, Fitness Appz relies on interval training to ramp you up from barely being able to do one push up to knocking out fifty without stopping. Six-week courses are also provided for sit-ups, chin-ups, and squats, getting you from flabby to fantastic (or at least in better shape) with just three-days-a-week for six weeks. In reality, Fitness Appz combines four of Infinite Appz's interval training apps into one super-app. Individually, 100 Pushups, 200 Situps, 200 Squats, and 20 Chinups each retail for $1.99, while Fitness Appz wraps them all together for… $4.99 (there's also a $4.99 Fitness Appz HD for TouchPad - it's the same app but bigger and harder to tote around the gym). One of the biggest challenges facing us for Mobile Nations Fitness Month is just getting our behinds up off the couch and exercising. Be it doing pushups during commercial breaks of going out for a run, getting off that couch is the first step. But what's step #2? That's what Infinite Appz's so aptly-named Couch to 5K aims to answer. Couch to 5K provides a three-days-a-week for nine weeks program designed to get your from nothing to being able to run a full five kilometers (3.1 miles) nonstop. Sound impossible to do in just nine weeks? It's not as hard as you might think, and the simplicity of Couch to 5K will make it easier. The app provides a evolving routine each day, starting with twenty minutes of alternating between jogging and walking on week one, day one to twenty minutes of jogging on day three of week five, finishing with a 30 minute jog set at the end of the nine week course. You're presented with a basic and linear interface that updates with the new day's course (assuming you finish the previous one) with a big countdown time in the center with a Start/Pause/Resume button below. Hit Start and you're prompted by a disembodied male voice with a neutral American accent to begin your warm-up with a five minute countdown. Once the initial warm-up countdown concludes, Couch to 5K automatically moves to the next stage of the day's workout: "Jog Now." For the first few weeks you'll alternate between jogging and walking, with the voice offering audible prompts as you go. As you progress through the program the jog periods grow longer and the walks shorter and less frequent, until you reach the point where you're just running non-stop. Which is the goal, no? Every platform suffers from abandonware - apps that are released, do well, and then aren't updated to reflect changes in user expectations, device APIs, and back-end services. Platforms like webOS and BlackBerry suffer from a rather high rate of abandonware thanks to the turmoil that has enveloped each platform. Developers have to put food on the table, so if they're not making money making apps for a specific platform, we can't say we blame them for moving on to greener pastures. But February is Fitness Month here on webOS Nation and the Mobile Nations network of sites, so we're taking a look at fitness apps new and old, good and bad. We already looked at JogStats, a rather basic and straight-forward run-tracker, and today we're going to put what should be a powerhouse app - SmartRunner - under the review microscope. Interval training is defined as physical training that alternates between high-intensity work and periods of low-intensity work. For maximum effect the high-intensity workout is supposed to be near maximum exertion, while the low-intensity recovery period should be much toned down, even to the the point of complete rest. An example of interval training would alternating between sprinting for a full minute and light jogging for a minute. The idea behind interval training is to boost cardiovascular strength and aerobic capacity, making for stronger, faster, longer-lasting athletes. You may not count yourself among the ranks of "athelete", but interval training can be of use to you as well. Thanks to SpeedyMarks' $0.99 Workout, you too can try out interval training. Workout is about as basic as an interval training app can be, and it doesn't need to be much more than what it is. Upon launch you're presented with three fields, a feedback selection, and a start button in a purple box. The fields let you set your work and relax period length (in seconds) as well as how many times you want the cycle to repeat. Feedback can sound a chime at each interval or be silent. Hit the start button and the purple turns a pulsating red, ordering you to work. Your position in the current cycle is listed at the top of the red with a period countdown time below. A trio of Skip/Pause/Stop buttons at the bottom let you slow things down or speed them up, depending on how the workout's going. Once your work period is up, the block turns red and advises you to relax. Each switch between Work and Relax is accompanied by a high-pitched chime sure to cut through your labored breathing. Workout is somewhat ambiguously named, being that it's an interval trainer and nothing more. But it does what it's supposed to do, and it does it with minimal fuss. Workout by SpeedyMarks is available now in the webOS App Catalog for $0.99 for all devices. Way back in the day when you went for a run, you just ran. Then came the Walkman, which brought music. Pedometers gave us our first logging capabilities, but that was fairly rudimentary. In recent years you could go with a fairly rudimentary and exceedingly expensive GPS-based tracker, but the user experience of those almost always left something to be desired. Fast forward to today, a time where every smartphone platform has multiple inexpensive apps that not only can track your run live, they log it with more information and analysis at your fingertips than we've ever had before. One such app for webOS is JogStats, a $3.49 creation by Rusty Apps. JogStats brings a level of polish and webOS-ness that some other run tracker apps lack, and has the added bonus of being mostly functional. Unlike some other run trackers, JogStats does not have a cloud backend, which while this means you can't automatically backup your runs and look at them from other devices, it also means (1) you don't have to deal with needed a data connection (GPS tracking is going to drain your battery fast enough) and (2) you don't have to futz around with online systems that change while the webOS app is left abandoned. The question is how willing you are to live without web access to your logs. Anyone who has used a webOS phone for any period of time knows that battery life is not one of the strongest features of those phones. While it has gotten significantly better from when the original Pre was first released in 2009, it's still a difficult task to make it through a full day with any type of moderate usage. 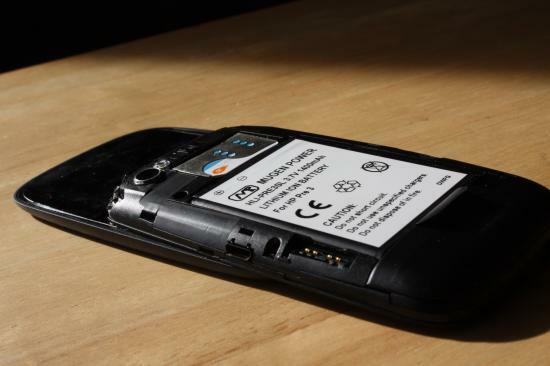 For Pre, Pre Plus, or Pre 2 owners, the good news was that you could use spare batteries from any of those phones interchangeably or purchase spare stock or extended batteries from places such as the webOS Nation store. With the official limited release of the HP Pre3 in Europe and the slew of AT&T (and a few Verizon) phones making their way to eBay, we found ourselves in a bit of a quandary: the only way to get a spare battery for those phones was to buy an extra Pre3. Not exactly an inexpensive (or efficient) proposition. And if you didn’t want to spend the hundreds of dollars on another Pre3 just for its battery, what would happen if/when the battery stopped working after extended usage, shorted out, or gets trashed? Seeing a potential business opportunity, Mugen Power Batteries (who previously made extended batteries for both the Pre and Pixi) created their own a survey late last year to gague interested in extended batteries for the Pre3. Within just a few hours of opening the poll, Mugen announced that they received enough feedback to justify development of Pre3 batteries. Pre-orders were opened in December for a 1400 mAh "SL" extended battery for $46.95 and a 2800 mAh "XL" extended battery for $98.95, the latter of which comes with a larger back cover for the Pre3. As compared to the stock Pre3 battery that clocks in at 1230 mAh, these batteries should provide an extra 14% or 128% of battery life before your phone needs to be plugged back in. While webOS devices do a great job supporting Bluetooth audio, there are times when you may want to go wired rather than wireless, especially if you're at all concerned about exposure to electromagnetic fields. The RF3 ENVi Natural Wood Stereo Earbuds with Earhooks, available from the webOS Nation Accessory Store (from which I received a complimentary pair for this review), have a few unique features that set them apart from other wired audio choices. First, the basics: The ENVi earbuds do a decent job of noise isolation (not cancellation, though), with a variety of rubber tips to allow the best possible fit for different ear sizes. Although the buds themselves do not always feel solidly seated on their own, the unexpectedly comfortable wire earhooks (which can be turned and bent) help support the ENVi earbuds and keep them in place. 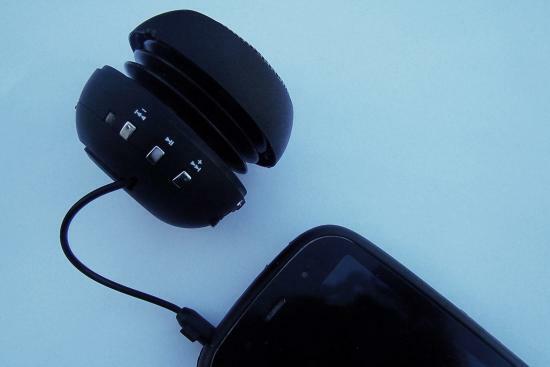 For telephone calls, the ENVi offers an in-line microphone along one of the two earbud wires; it is usable but not ideal either in placement or quality. The microphone also doubles as a squeeze control for pausing/resuming music that works with webOS. The overall look is minimalist and industrial, combining angles and curves in a pleasing (to me, at least) way. As the ENVi is unpowered, it does not require charging or separate battery, nor does it offer any independent amplification of the sound it is carrying. While the ability to ZIP and UNZIP files directly on your webOS device has existed in homebrew via command line (or embedded in apps like Save/Restore from WebOS Internals) for a long time, the release of Archive Manager by pcworldSoftware finally enables the general webOS user to both compress and extract archived files. Currently on sale for $1.99 for the first week of its release and available for any device running webOS 2.1 or higher (including the TouchPad), Archive Manager can extract almost all archive formats (e.g. ZIP, RAR, 7z, tar, gzip, bzip2, iso and many more) or compress files and folders (to a ZIP, 7z, tar, gzip or bzip2). In addition, it is also has a full File Manager built into the app. While the file manager aspect of the app isn't as fully featured as Internalz or Gemini File Manager, it still gives you quite of lot of features such as the ability to copy, move, rename, email, delete, open or create files and folders. Those features alone would make this a worthwhile investment (if Internalz Pro weren't already available for free in Preware). As for the archiving nature of the app, it's simple to use and gets the job done. To compress/archive files or folders, you just select them using checkboxes in the file listing, tap an icon on the bottom of the screen to access the "multi-select menu" and then select "compress files". You then have an option to name the archive, select the archive file type, set a password, and even specify a size limit to split the archive into multiple files. To extract a compressed file, you just tap it, select "extract" from the pop-up menu and optionally specify the location to extract the files. If you have an archive that is split among many files, just extract the first one and the app will automatically extract them all. In a hurry and don't have time to read our entire review of the unreleased and unannounced HP TouchPad Go? That's fine, though we'd recommend that you find the time to read about this rare seven-inch webOS tablet that could have been. In the meantime, we went ahead and summed up the whole thing in under five minutes for you above in the webOS Nation video review of the TouchPad Go. You've got to have five minutes, right?